Early stems of Lilium 'Eyeliner' emerge from the leaf litter. Color is pushing up from the ground, which is covered in leaves and other debris left from last November. 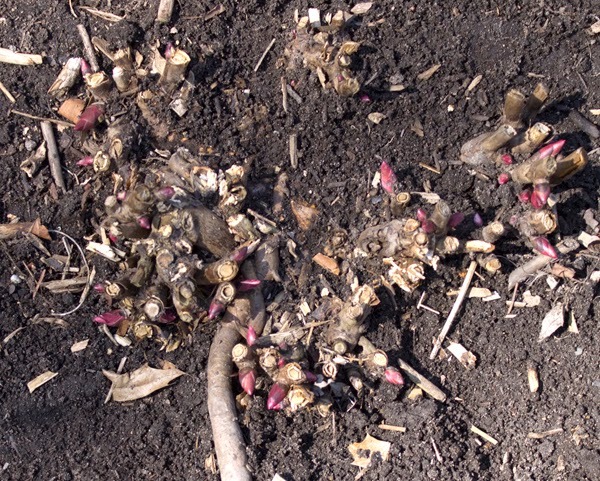 Mostly oak leaves, the litter is compacted from the snow and must be teased off gently and at the right time so as not to damage the future stems of peonies and lilies. Sure, this could have been done in November, but who really wants to spend another day in the garden when white and brown are the next shades on nature's color pallet? Heuchera 'Plum Pudding' shows it's alive by its color. The Heuchera planted last spring in my garden have taken a beating, but are still drawing breath, so to speak. Although lacking leaf, their crowns show promise, and will soon sport leaves. 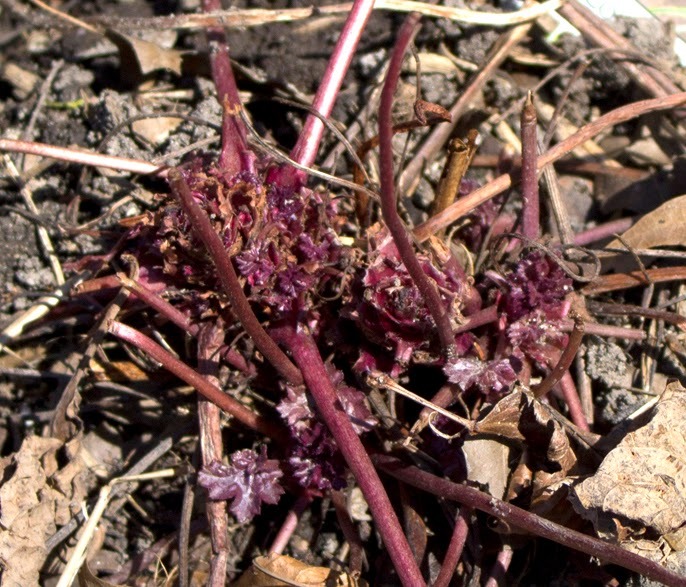 A wide divergence in emerging peonies shows the diversity of this group. The type I find most interesting is shown by the Intersectionals. 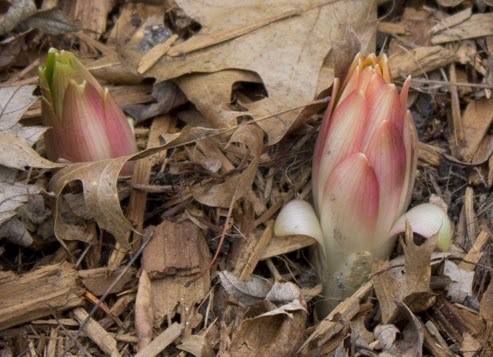 A cross between a tree and an herbaceous peony, these sprout from stems above the ground and roots below the ground. I have two Intersectional peonies--'Al's Choice' planted in 2007, and 'Yellow Doodle Dandy', planted in 2009. 'Al's Choice' has spread out to an above-ground crown about 18" in diameter. One of its roots has even emerged from the ground, and to cover it up would mean covering some of the stem buds. I'd like to divide it this fall and find new homes for the three or four plants it should create. 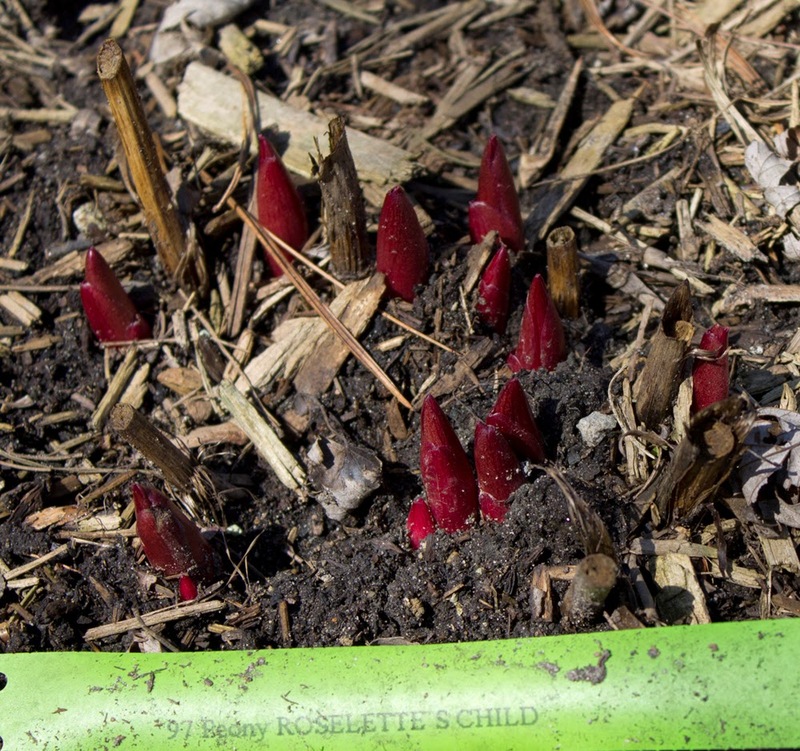 The many buds of Intersectional peony 'Al's Choice' turn deep pink and begin to swell. 'Al's Choice' brightens up the garden. The better-known herbaceous peonies are showing their " dear rosy snouts," an apt term coined by gardening legend Gertrude Jekyll (1843-1932), saying sh couldn't wait to see them as they poked through the earth. 'Roselette's Child', an herbaceous hybrid peony was planted in my garden in 2012, so this will be its third year, which is when most herbaceous peonies finally show what they can do. Although 'Roselette's Child' bloomed last season, I'm really looking forward to seeing its flowers again. 'Roselette's Child' is described as having peachy-orange-yellow petals, and should be sheltered from harsh sun in order to maintain its color. I've planted mine in a location where it gets sun until late in the afternoon. The delicate beauty of 'Roselette's Child' is a welcome sight in May. I also have 'Roselette', a peony introduced by A. P. Saunders in 1950. 'Roselette's Child' was introduced in 1967, 14 years after Saunders' death. In his later years, Saunders worked with a wide array of peony species sent to him from all over the world. 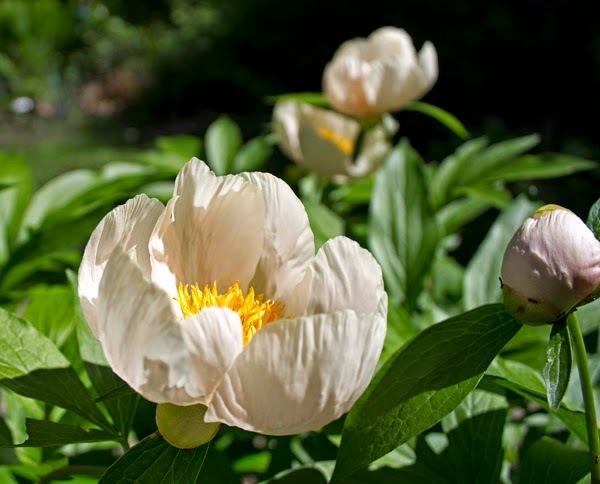 In order to inject some yellow into herbaceous peonies, he used a species called mlokosewitschii, a pale yellow herbaceous peony native to the Caucasus Mountains. More correctly this is actually a subspcies of the species daurica, and is listed as Paeonia daurica subsp. mlokosewitschii. The mloko peony (a shortening of the name by Saunders) is also referred to as "Molly the Witch." I've tried growing the actual species of Molly the Witch, but she didn't do well. Luckily, Saunders' hybrids live on and are fairly easy to find. Not all peonies have a petal-packed shape. Some, like 'Roselette's Child' possess a simple beauty that is welcome in a garden otherwise crowded with such attention-commanding plants.